NPR Doesn't Confer 'Dr.' On Ph.D.s. Here's Why. Christine Blasey Ford testifies to the Senate Judiciary Committee on Capitol Hill in Washington D.C., on Thursday. Longstanding NPR policy is to reserve the title of "Dr." for an individual who holds a doctor of dental surgery, medicine, optometry, osteopathic medicine, podiatric medicine or veterinary medicine. 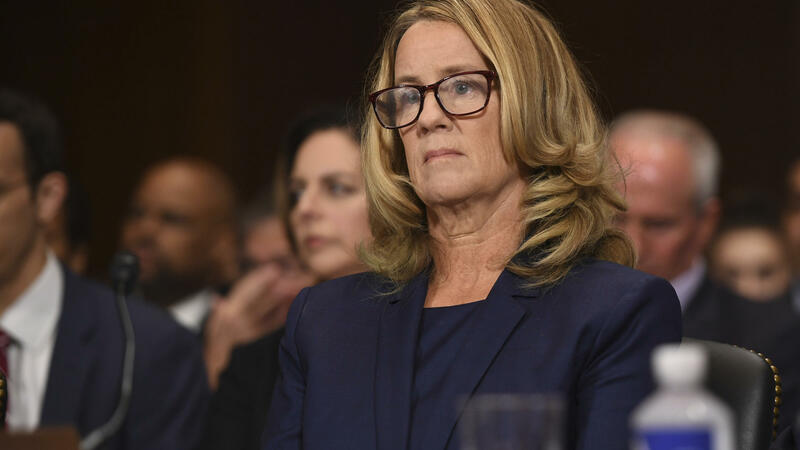 Ford, according to an NPR profile, is a "professor and research psychologist in Northern California at Palo Alto University and the Stanford University PsyD Consortium, a clinical psychology program where she teaches statistics, research methods and psychometrics." She holds a Ph.D. in Educational Psychology from the University of Southern California. For some listeners, the disparity of hearing Kavanaugh called "Judge Kavanaugh," at times, and not hearing Ford referred to as "Doctor" rankled. One called it "offensive," saying it showed how women are disrespected in relation to men. Another called it an "insidious bias." An explanation of the policy on 1A (which NPR distributes but does not produce) provoked complaints to the Ombudsman Office. If appropriate in the context, Dr. also may be used on first reference before the names of individuals who hold other types of doctoral degrees. However, because the public frequently identifies Dr. only with physicians, care should be taken to ensure that the individual's specialty is stated in first or second reference. The only exception would be a story in which the context left no doubt that the person was a dentist, psychologist, chemist, historian, etc." NPR's policy is not a case of gender bias; it also applies to men. Memmott told me NPR has "at times referred to her as 'Professor' Ford. We have identified her specialty. And I'm sure we have referred to her as Dr. at least a few times." NPR should consistently include that information, where it's relevant. As for the "Dr." policy, it exists to provide clarity, which is what a newsroom should strive for.